Some translators have loving kindness rather than mercy in the quote above from Psalm 62; but I presume there is no real difference as to the character of the word. The religious mind educated upon the theories prevailing in the so-called religious world would here recognize a departure from the presentation to which they have been accustomed: for to fit their way of thinking, the verse would have to be changed thus: “To thee, O Lord, belongeth justice, for thou renderest to every man according to his work.” Let the reason for my choosing this passage, so remarkable in itself, for a motto to the sermon which follows, remain for the present doubtful; but endeavor to see plainly what we mean when we use the word justice, especially the justice of God—for his justice gives existence to the idea of justice in our minds and hearts. Because he is just, we are capable of knowing justice and have the idea of justice so deeply imbedded in us. What do we mean most often by justice? Is it not the carrying out of the law, the infliction of penalty assigned to offence? By a just judge we mean a man who administers the law without prejudice, and where guilt is manifest, punishes as much as, and no more than, the law has lain down. It may not be that justice has therefore been done. The law itself may be unjust, or the working of the law may be foiled by the parasites of law for their own gain,. But even if the law is good, and thoroughly administered, it does not necessarily follow that justice is done. Today we begin George MacDonald's sermon Justice. My initial thought is that the inseparable dependence of the truth of Justice in the being of God from the garden as the great orchestrator of Redemption. The beginning of this sermon throws a direct question into our path: what do we as God's created offspring mean, what do we think, when we believe and claim to know of justice attributed to God, the concept of it, the implications, the reality of it in the created world. Psalm 62:11-12 "Once God has spoken: twice have I heard this: that power belongs to God, 12. and that to you, O Lord, belongs steadfast love. For you will render to a man according to his work." MacDonald brings us to the truth of God, ahead of the functional fallacies we hold in practice regarding Him, the perfect and righteous standard, from whom we may ever know one small glimmer of knowledge of what is good, right, and just. MacDonald brings us to a Truth that sheds light on to our "parasitic" tendency to falsely apply our power through the law. It is a good reminder that Power does belong to God, the power to bring Justice, loving kindness, indeed life to us in the midst of our death. 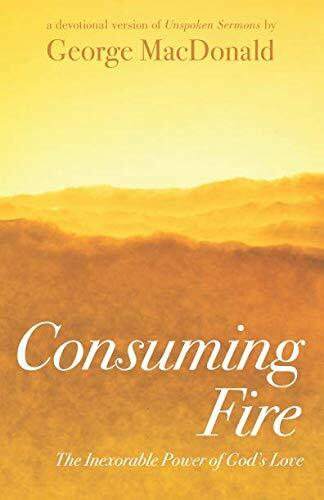 In the conclusion of Kingship, Jess Lederman's commentary rightly warned of the trembling and fearfully perilous condition of our souls when we choose the "outer darkness" in our path through being. We face death and its destructive force every moment we age and come closer to our physical end, and every moment when our souls align to this deathly state and its satisfaction over the spiritual condition of life in Christ and satisfaction of unity with Him. So as to redemption and justice. I would say, the meaning of loving kindness, of steadfast love, of justice, is the undeniable first work of God in response to our sin, in the garden and ever since, and that is, not the continuation of our separation from him through the working of a justice that punishes, but rather, a great and just setting of things right, above our continuation of law, of power, of more death, rather than more life. As I began to study this passage, I was compelled to search the word redemption, and found it in 69 biblical references. Countless times, God pronounces himself to his children as The Redeemer. Not only in reference to the attacks of great evil against Israel, but further, as The Redeemer of his children from their own sins. Justice, loving kindness, rescue, Redemption, all closely aligned, must be viewed in a perspective of which they overlap, one before the other, in various orders, through the great story, and in complexity inviting our humility. Justice, from God must be enlightened by his telling of himself to us. Psalm 130:7 "...hope in the Lord! For with the Lord there is steadfast love, and with him is plentiful redemption."